As the holidays near one thing I like to make is my own Floral centrepieces. I do this not only for myself, but for gifts and events I plan or host. Like most I just love flowers, and I never get bored making arrangements. I have had a few friends say that floral arranging is not their forte and they just don’t know where to begin. I find the thing that works for me in this style of arranging is to start with beautiful greenery first then add your flowers from there. I like the local florist for specialty items I may want to include in a bouquet, however, my favorite spot to buy flowers is Costco. They have a wide selection of fresh beautiful flowers for minimal cost. You can buy 2 dozen roses for under $20.00. I kid you not. Although their selection includes ready-made bouquets, I prefer to buy a variety of their smaller bunches and make my own arrangement. Flowers in the house makes me happy, especially in the winter. Flowers make everyone smile. I often walk by them and “stop and smell the roses“. Small moments of the little things that evoke happiness in the brain. Flowers bouquets make great centrepieces. You can do this on a larger scale as I did below or just a couple for your house. I enjoy making these when we have holiday drop in invites. Most hostess’s would love to receive these over a bottle of wine any day. 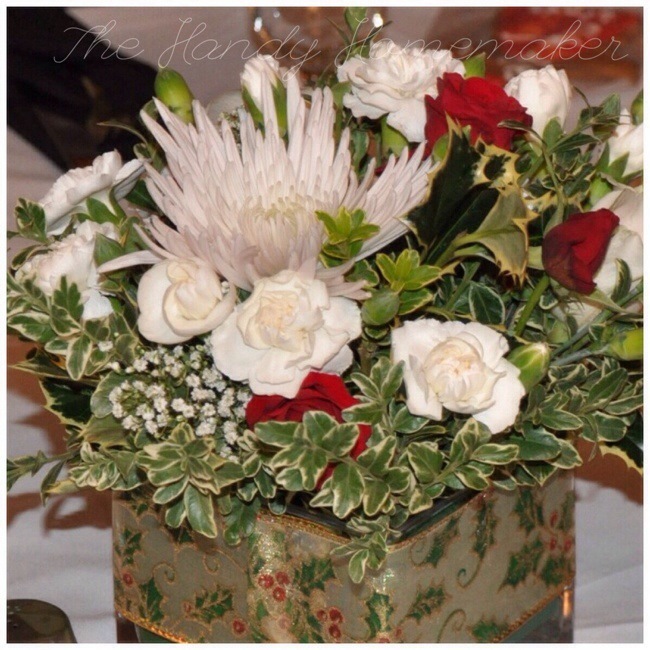 Here are a few tips to have wonderful floral display that lasts the holidays. Buy the freshest flowers you can find. Look for flowers that are just starting to open. If they have already opened completely and have signs of browning then you don’t want them. Put those flowers in water immediately. As soon I get home I place the flowers in my Laundry room sink in water until I am ready to start arranging. Stop at your local florist for specialty items. For example, I wanted various Christmas greenery for these bouquets, they usually have Oregonia, and Holly which make beautiful backdrop for your holiday arrangements. Buy and make your arrangements as close to the day you need them as possible. There are various places you can buy lovely vases for your arrangement. Check the Dollarstore, it can have many great vases for your arrangement. I usually head to Walmart for vases. They have a big variety of your basic vases for low-cost. Of course for specialty ones like Mercury glass I look in stores like Homesense, Pier 1, and Bowring. Use a floral flower food. It really does help make your flowers last by giving the flower nutrients needed to last. When placing your flowers in a vase with water only no Oasis, I change the water every 3-4 days and remove any dead flowers. This make the arrangement last longer, be sure to add more floral flower food to the water. If the arrangement is for a gift try to store the flowers out of direct sunlight or warm areas of your home. As well, if your arrangement is near a warm spot moving it to a cooler spot for the night and then returning in the morning can add days to your arrangement. Mist your arrangement with a squirt bottle filled with water. Fill a sink or bucket with water in the area you are doing the arranging. Cut the stems off under water to prevent air bubbles in the stem enabling free flow and uptake of water to the flower. Place floral oasis (wet) in my containers cut to size. This keeps everything where you placed it in the bouquet. 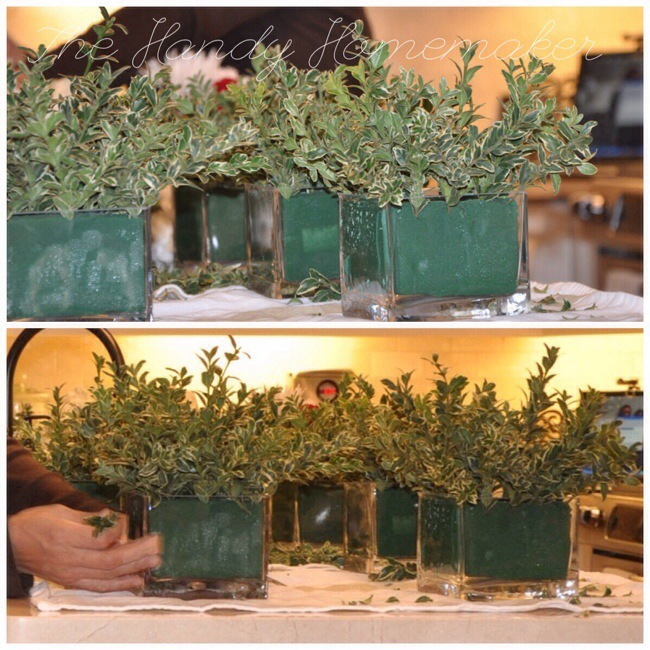 I was using square clear vases and the Oasis was going to be visible thus, I wanted the oasis to fit perfectly. Using oasis makes transporting an ease. I once made large vases for a golf event with golf balls in the vases. I thought I only put a minimal amount of water in the vases until I transported them and the round vases started tipping. Well, let me tell you just a small amount of water spilt in a vehicle from 6 vases is still a big mess to clean up. Rookie mistake! Cut the oasis just a hair bigger that the vase and shoved it in so that it would stay snuggly in place. Soak the oasis completely with water before starting to fill with flowers. 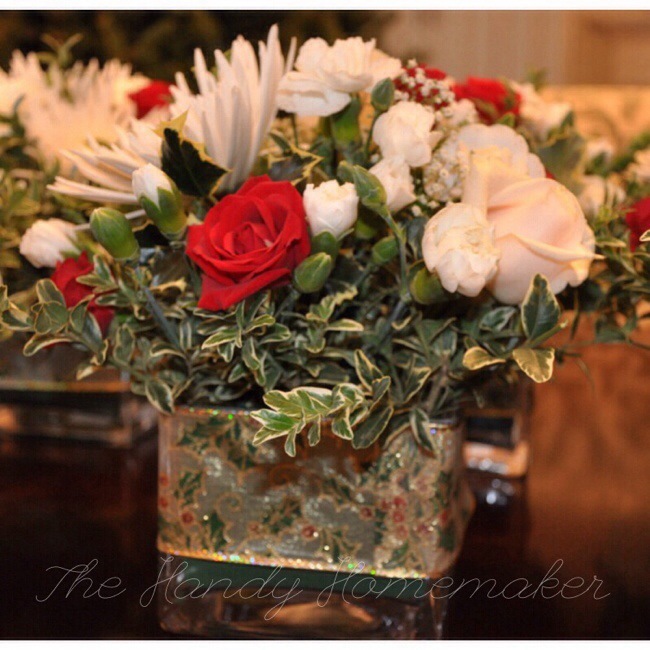 You can use various items to hold your flowers in place in the vase. I have many antique “flower frogs” that were given to me. If you don’t have any of these available use glass marbles, pebbles, or small stones. Once the greenery is all added I start filling with the flowers I have chosen. I place each flower in the vase same way as I added the greenery. This way they are similar and uniform. It also saves time and mental energy. When placing flowers start with one color and style. 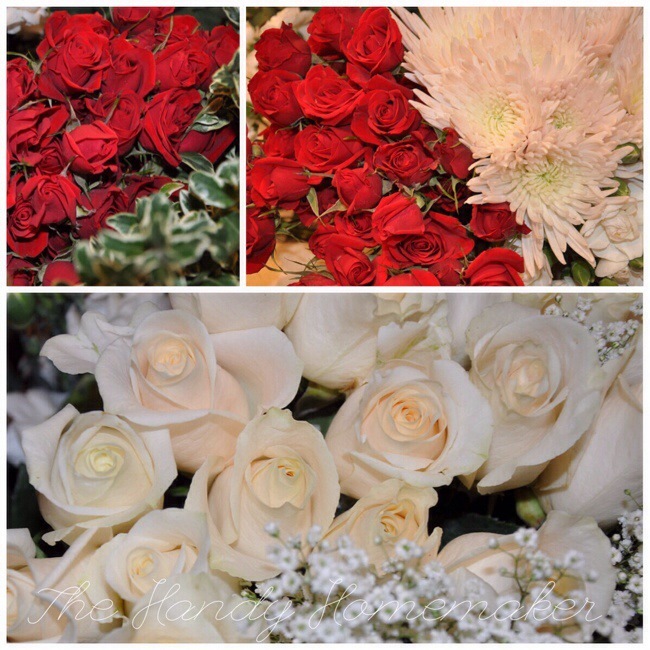 For example I started with the Chrysanthemum’s, then the Carnations, the white roses followed by the red. I added wide ribbon with hot glue that covered most of the jar and matched the flower them. When making this type of bouquet for a centrepiece add a floral candle pick to the centre of the arrangement and place a non drip taper candle in the arrangement.